In order to adapt to the educational demands of an increasingly digitized and globalized society, reformers have pointed toward games and their communities as potential models for what 21st-century educational systems might look like. As educational game research develops as a field, the need for design frameworks that leverage contemporary perspectives on education, learning, and established commercial game design techniques grows. In this chapter, the authors briefly describe current educational demands that highlight a shift away from content-focused curriculum and outline the design process used to make the game Citizen Science, a game to teach civic science literacy. By providing insight into the process of design, the authors hope to illuminate the relationship between theory and its enactment. Just a few short years ago, the idea of combining games and education was met with skepticism, if not scorn. This attitude has changed as educators have noted that video games are worlds capable of communicating sophisticated ideas (Jenkins, 2004; Squire, 2006), instantiate in their designs the principles of situated learning theory (Gee, 2003, 2005), are leading activities for academic or lifelong pursuits (Squire & Steinkuehler, 2005) and can, in some cases, be used for the pursuit of traditional academic goals, such as learning history, physics, or ecology (see Ferdig, 2009; Shelton & Wiley, 2007). While investigations that design and investigate games in the pursuit of education have progressed, more specific, even pragmatic issues have started to take shape. How can these games be implemented in classrooms? Can a more precise vocabulary be developed to analyze games? How does one actually design a game that is both educational and fun to play? 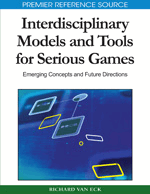 This chapter investigates the latter question by investigating one such design theory that seeks to extend earlier notions of games as designed experiences. Before we can address this complex question, however, we need to say a little more about the current state of the educational system and the role that games may play.